Sun., Sept. 2, 2018, 4 a.m. When Andrew Dill and his family relocated from Tennessee to Spokane, they looked at more than 40 properties, from Post Falls to the South Hill. But once the family came across a waterfront home in Nine Mile Falls, they were sold. Another benefit of the home – which overlooks the Spokane River and is the first waterfront property purchase for the Dill family – was that it was financially obtainable. As waterfront homes in Seattle sell at a premium with prices starting at more than $1 million, some Spokane real estate agents say homes near the water in the Inland Northwest remain fairly affordable. Fanning said prices for waterfront homes vary depending on the area and whether homebuyers choose to purchase vacant land and build, or buy an existing home. Statistically, buyers from the Tri-Cities, Pullman, Sandpoint and Spokane account for about 70 percent of waterfront sales every year, with the remaining 30 percent of sales from beyond the area, he said. While the waterfront-home market in Idaho experienced an overall jump in median prices since August 2017 with property values in Coeur d’Alene exceeding $1.4 million, one home near Hauser Lake sold for $165,000 this year, according to the Coeur d’Alene Multiple Listing Service. 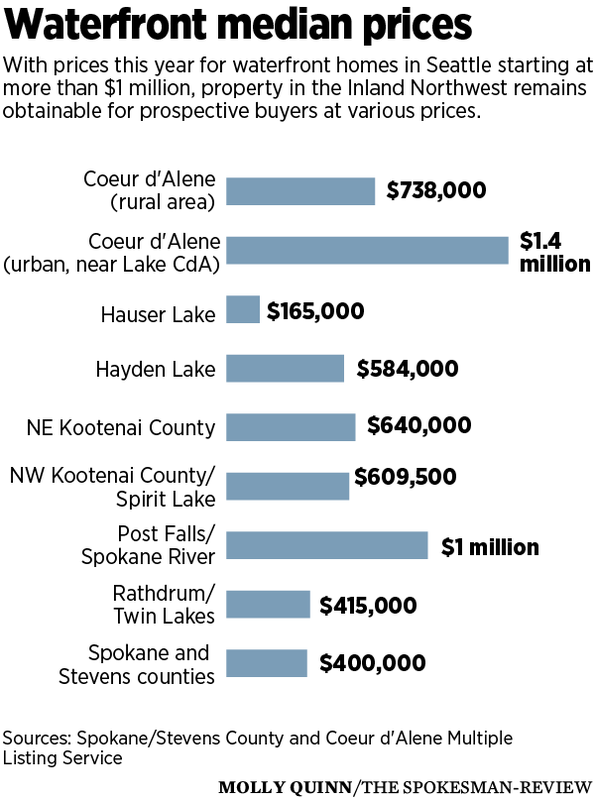 Post Falls saw a 66 percent increase in prices, which rose from more than $620,000 to $1 million over the last year, and northwest Kootenai County waterfront home values increased significantly with a 174 percent jump in year-over-year prices from $222,000 to more than $609,000. Waterfront prices in Spokane and Stevens counties are up by more than 12 percent over last year, with an average median price of $400,000, according to the Spokane MLS. A non-waterfront home in Spokane costs more than $235,000, according to a July report from the Spokane Association of Realtors. But compared with larger metro areas, waterfront is still fairly affordable in the area, said Ken Sax, president of the Spokane Association of Realtors and designated broker for Keller Williams Realty. “There’s a lot of people coming in from Western Washington because, when you look at Seattle or Los Angeles, are you going to pay $5 million for waterfront or $650,000?” he said. The local waterfront market has been stable over the past six years. But this year there’s been some inflation, with new listings priced on the high end, Fanning said. The total estimated value of waterfront homes in June was $134 billion nationally, with a sale price premium of 36 percent, down from 54 percent in 2012. A price premium is the additional amount people pay to live near a body of water. Nationally, the median value of a waterfront home is $426,300, according to a report by Zillow. Because prices for waterfront homes grew faster than regular homes during the housing boom, they weren’t affected as strongly by the economic downturn, resulting in premiums remaining roughly the same in the years following the economic collapse, according to the report. As the housing market bounced back, the price gap between non-waterfront and waterfront homes has narrowed in the past few years. Sax said that while waterfront home prices are up in the local market, movement is not necessarily brisk, which could be attributed to sellers overpricing their properties. Also, there tend to be fewer buyers and a lower inventory for waterfront properties, especially in a higher price bracket. “It’s a smaller market for waterfront, just like it is for horse properties and golf course properties,” he said. Sax advises prospective buyers to work with a Realtor, have financing in place and know whether they want a waterfront property for the view, fishing or watersports to help determine the best location. The Dills, who have resided in their waterfront home for three years, are now selling it to downsize. They’ve already had prospective buyers from California and Seattle look at their property, which is priced around $450,000. Published: Sept. 2, 2018, 4 a.m.